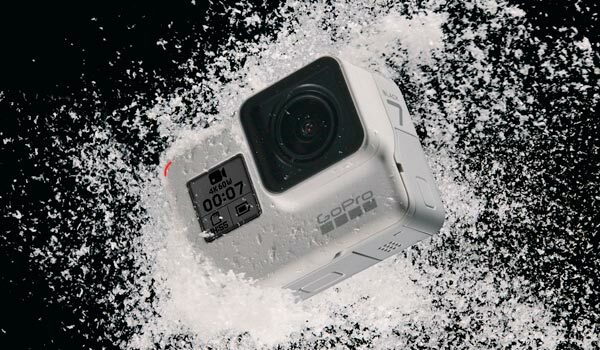 GoPro launches limited edition GoPro HERO7 in Dusk White – Spotlight Report "The Best Entertainment Website in Oz"
What’s white, but not quite, and black all over? GoPro’s new limited-edition HERO7 Black camera in Dusk White, available around the world beginning 3 March. This is the first time GoPro has released a special colorway of its flagship camera, which means you get all the goodness of the award-winning HERO7 Black while earning bonus points for limited-edition style. The new HERO7 Black in Dusk White is also the perfect blank canvas to wrap your GoPro in color on the days when you’re feeling a little more funk. We partnered with GoPro athlete and MotoGPä legend, Valentino Rossi, to create a neon yellow Sleeve + Lanyard emblazoned with Rossi’s race number, 46. This special-edition accessory joins the current lineup of blue, white, red, black and pink Sleeve + Lanyard silicon sleeves that keep your GoPro at-the-ready to capture the perfect shot. The Valentino Rossi Sleeve + Lanyard is available worldwide on GoPro.com and select retailers for $29.95 beginning 3 March. And while the HERO7 Black in Dusk White might be a limited edition, GoPro’s Plus subscription service is anything but. Our cloud-based storage service keeps your footage looking as clean as the fresh new colorway for just $7.50 a month. Plus subscribers benefit from unlimited video and photo storage at original quality, along with other always-on benefits, including 50% off select GoPro mounts and accessories and VIP status for customer support. GoPro HERO7 Black in Dusk White ($599.95) will be available online from GoPro.com and selected Australian retailers from 3 March and will hit shelves on 23 March. To learn more about what’s happening at GoPro around the world, visit its news page, The Inside Line.